The brand new ersa ECOSELECT 1 selective soldering system - the perfect start-up solution for efficient and reproducible soldering processes in small-scale and customized production. 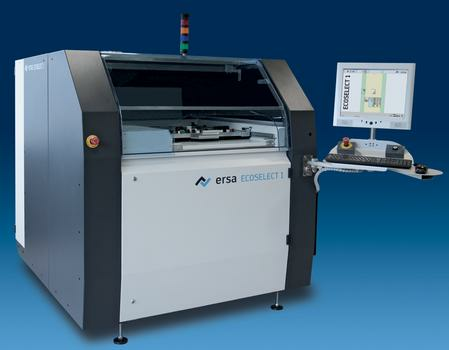 Ersa, the global technology leader in selective soldering systems, has expanded its product range by the ECOSELECT 1: a selective soldering machine requiring less than 3 m² of space - thus fitting optimally into cell production environments. In all process steps the semi-automatic ECOSELECT 1 system uses the same successful and proven Ersa Selective Soldering Technology as the large Ersa VERSAFLOW systems and does not compromise at all in quality and accuracy. Due to its universal pallet fastening, the ECOSELECT 1 can handle PCB sizes of up to 16" x 20". The fluxer processes water-based fluxes with highest positioning accuracy and lowest amounts of flux deposited. Numerous control features such as spray monitoring or continuous pressure monitoring of the flux storage tank provide for the outstanding Ersa Process Safety. Just like the VERSAFLOW product line, the ECOSELECT 1 is equipped with a full-area preheating system. Its bottom-side heating consists of eight emitters that can be switched in groups to match their power with the assembly's heat requirements and size. The top-side heating of ECOSELECT 1 is optimally harmonized with the bottom-side heating and provides effective, reproducible and thorough heating also of complex and demanding assemblies. A convection is created by means of the venturi effect. Due to the convection, the heating energy distributes evenly over the entire machine width consuming little resources and minimizing machine weight and size. The ideal amount of energy can be transferred as required in a reproducible manner because of the dynamic top-side heating - also for large assemblies with many copper layers and large components. An electromagnetic solder pump works in the solder module of the ECOSELECT 1 just like in the solder modules of the the VERSAFLOW selective soldering systems. As the pump does not incorporate mechanic parts, the formation of dross and dust remains at a minimum so that the solder pots require extremely little maintenance. The pump ensures very constant flow rates thus offering an exact and precisely adjustable solder wave height. Dynamic process parameters such as solder level, solder wave height and solder temperature are continuously monitored and documented. In this way perfectly shaped, reproducible solder joints are ensured. Not least because of the innovative "Peel-Off" Feature the ECOSELECT 1 with electromagnetic solder pump points towards zero defect production. Thus bridging is not an issue, even when soldering on a horizontal conveyor. The innovative dual solder pot represents an enormous added value for the production. It provides flexibility, since different alloys can be processed without machine downtime due to solder pot exchange: The solder pots can be activated separately via an additional lifting unit. 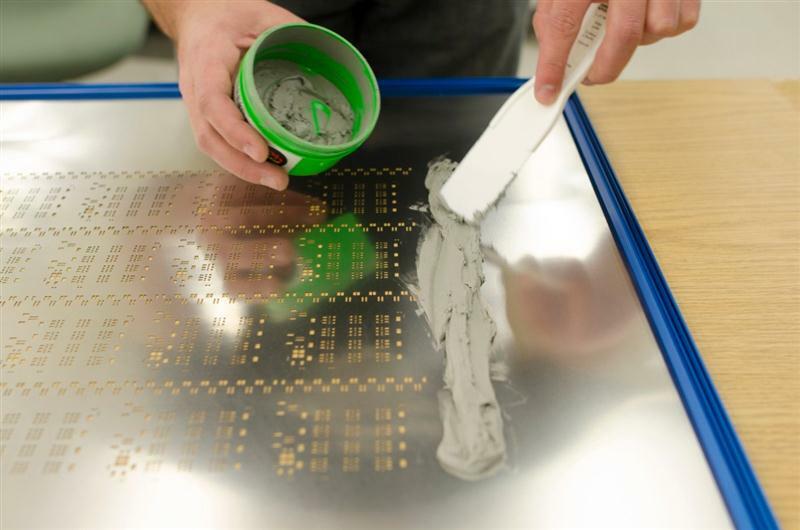 The solder pot activation is defined in the solder program enabling the processing of two different solder alloys. Consequently high machine downtimes due to solder pot exchange are history. Assemblies in lot sizes of one can be processed without having to fear contamination of the solder alloy. Alternatively this system can also be operated with solder nozzles having different diameters. In this way, a nozzle with a large diameter might be used to solder connectors while the second nozzle with a small diameter might be used to solder spots that are difficult to reach, for example. The ECOSELECT 1 is operated via a PC control with ERSASOFT. This visualization software offers extensive functions supporting the user in correct machine operation. Standard features of ERSASOFT are a process recorder which continuously memorizes the actual values of all aggregates relevant for the solder process or the solder protocol storing process data for traceability according to ZVEI standards. An extensive alarm management file is also part of the supply scope. All occurring messages are stored with a time stamp and user identification. The entire data is available as XML files and can therefore easily be worked on in higher systems. By means of the CAD Assistant DXF files of boards can be used to generate the solder program. Alternatively the user can set up the solder program based on the picture of a scanned PCB. All movements of the fluxer or solder nozzle are entered graphically in the image of the PCB and the proccess data is added. The solder program created in this way can then immediately be used in the ECOSELECT 1.